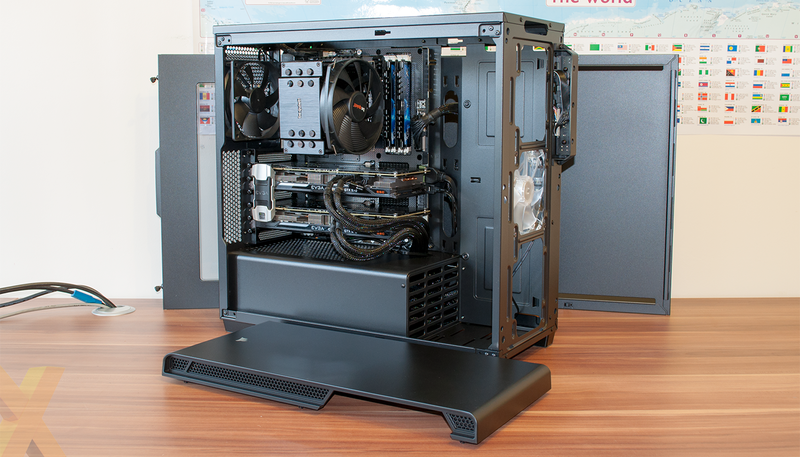 Corsair refreshed its chassis portfolio the other week with a trio of new launches targeting the premium, mid-range and entry-level markets. The eye-catching Crystal Series 570X RGB and 470X RGB were the duo that hogged the limelight, but if you're keeping tabs on the purse strings during the costly Christmas season, the affordable Carbide Series 270R may be the most attractive new addition. Introduced to market in windowed (£65) or plain (£60) variants, the 270R is Corsair's latest mainstream mid-tower solution and is described by the manufacturer as "compact and engineered for building high-performance yet minimalist systems." 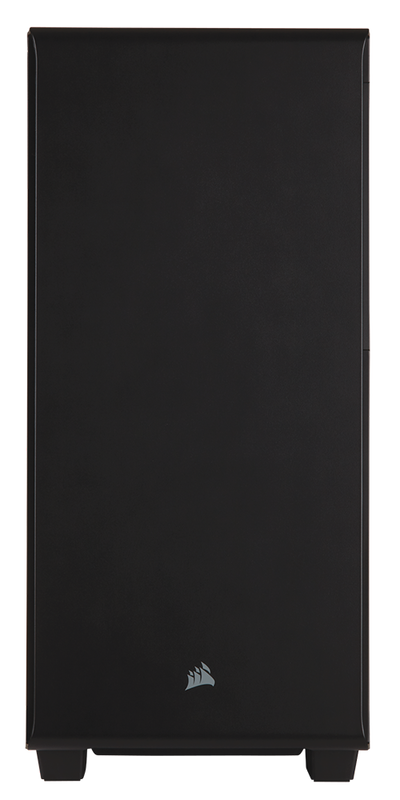 Dimensions of 509mm x 210mm x 460mm aren't in keeping with our definition of compact, yet the case does look suitably understated, with an all-black colour scheme and very little in the way of external interruption. Aesthetics are always going to be a personal preference, and while some will consider the 270R a little too plain for their own taste, those seeking a no-frills solution should feel right at home. At this price point, we reckon the tinted Perspex window works well, and there's enough room on the inside to show off a range of powerful gear. We've had a few cases in recent months where we've felt the need to refer to the manual to see how some of the extra features are best utilised, but there's no need to look anything up when working with the Carbide Series 270R. And that isn't necessarily a criticism - sure, it's short on interesting additions, yet on the flip side it's spacious and extremely easy to build into. 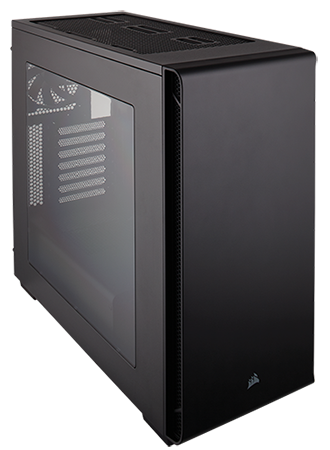 It's the sort of case that stands out as a safe choice when you're putting together a PC for a friend or neighbour. Almost everything is logically positioned, though the one exception is a potential deal breaker. 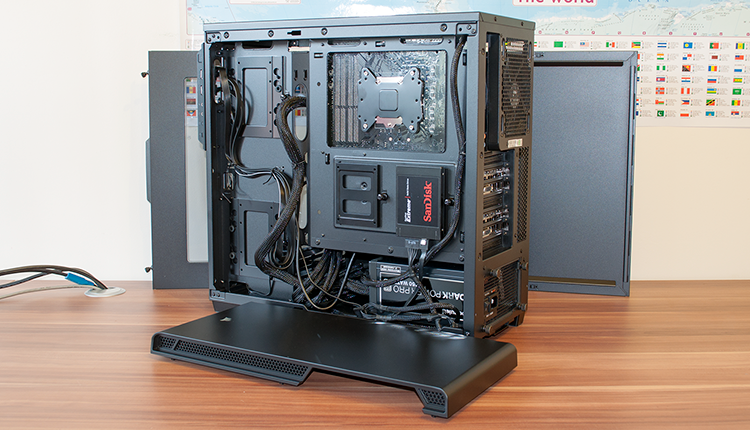 For some reason, the column of I/O ports, which includes power, dual USB 3.0, audio jacks and reset, is positioned to the side of the right-front edge. If you're buying the windowed model, there's a good chance the window will be facing the user, putting the I/O ports in a position that's unnecessarily awkward to reach. Keeping things simple elsewhere, Corsair's internal layout includes a shroud for the PSU bay, four drive trays attached to the rear of the motherboard panel (2x 2.5in and 2x 3.5in), a good-sized cutout for CPU cooler installation and cable-routing holes to the sides and above. 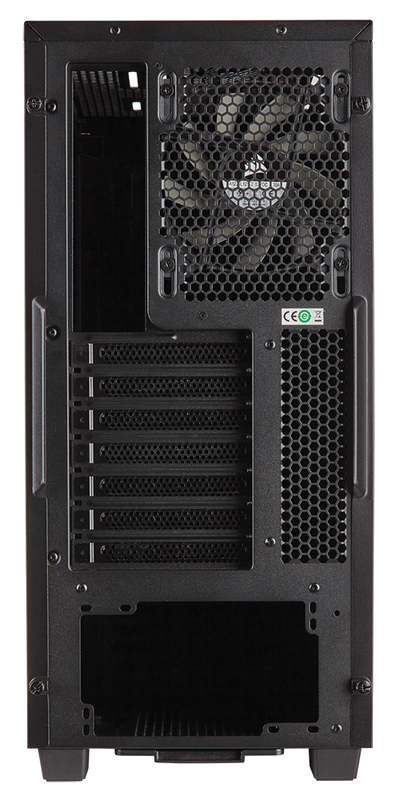 What you don't get is rubber-grommets on any of the cable holes, sound-dampening materials or 5.25in optical bays. It's very much a case of simplicity, if you excuse the pun. And simplicity is no bad thing. Everything is straightforward with regards to layout and we had our test platform fully built in under 10 minutes. 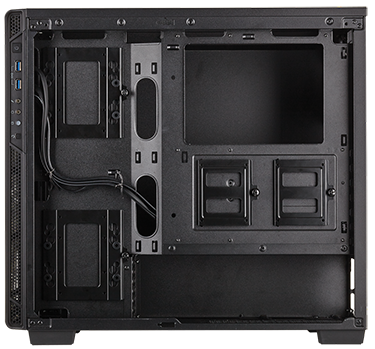 There are no extra cables to mess about with, and the spacious interior can easily accommodate an ATX PC with a couple of graphics cards. GPU clearance is ample at 370mm and there's room for a CPU cooler measuring up to 170mm tall. Build quality is decent throughout and the default fan configuration - a 120mm front intake and a 120mm rear exhaust - should be plenty for any sort of mainstream build. 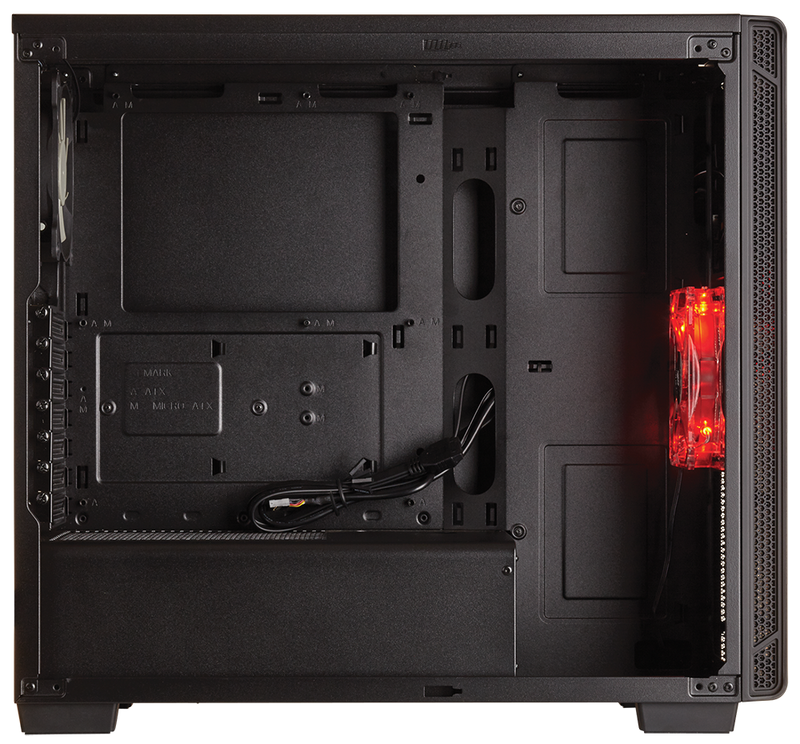 The red LEDs on the front fan in our estimation add nothing to the case and if anything detract from the clean exterior, so we'd be inclined to swap it out for something sleeker. The front of the chassis can house a trio of 120s or dual 140s, making it a good spot for a large radiator, and there are also two 120/140 mounts in the roof. The Carbide Series 270R has potential, but there are going to be compromises at this price point and we've identified a few during the build process. 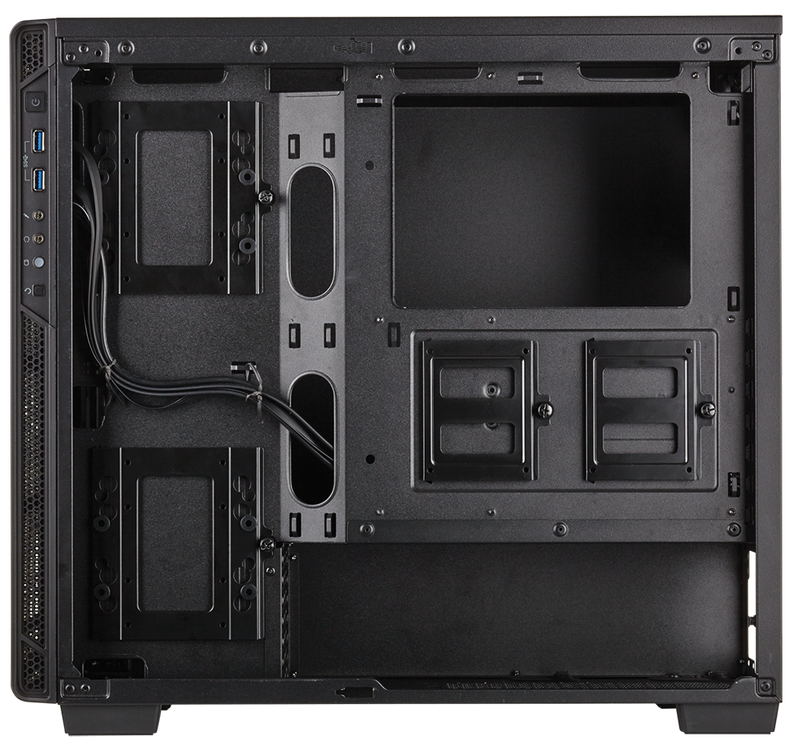 There's no dust filter behind the front panel, there's no cover of any type on the top mounts, and we aren't sold on the idea of the PSU shroud being enclosed on the cable end. It helps to make things look tidy, but if you're using a modular supply the closed end restricts access to the cables. Minor issues in the grand scheme of things? Perhaps, and on the whole the Carbide Series 270R is easy to get along with. The position of the I/O ports is our biggest bugbear, but that aside, the case looks sleek, has plenty of room, is easy to work with and does a good job of making a potent build appear neat and tidy.